TSKgel SuperMultiporeHZ column line consists of three columns of 4.6 mm ID x 15 cm with particle sizes of 3, 4 and 6 µm. The semi-micro dimensions offer high speed analysis and low solvent consumption with precise results. The particles in TSKgel SuperMultiporeHZ columns are monodisperse in size and contain a broad range of pore sizes. The unique multi-pore technology creates an extended linear calibration curve within each particle, thereby greatly diminishing chromatograms with inflection points. 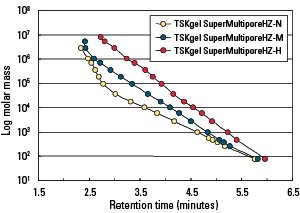 Learn more about the multi-pore particle technology used in the TSKgel SuperMultiporeHZ columns. As shown in the figure below, each of these columns feature a distinctly different linear part of the calibration range.